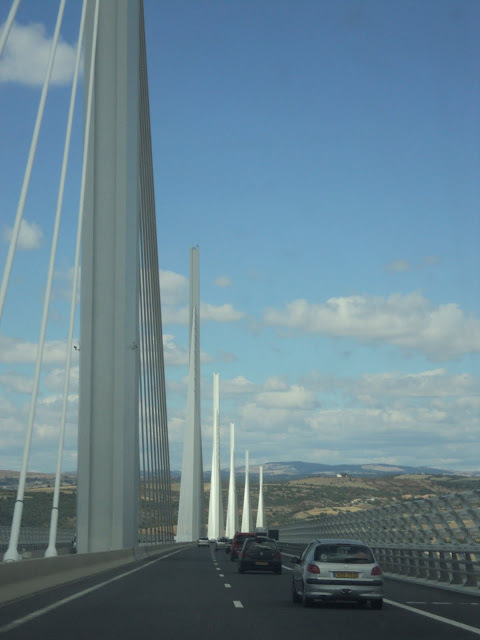 This is the Millau Viaduct, which crosses the Tarn River along the A75 highway in south central France. It's about two and a half kilometers long, and it's quite a sight on a clear day. It's the tallest bridge in the world with a height at one point of 343 meters. Designed by French structural engineer Michel Virlogeux and British architect Norman Foster, the project took a little over three years to build and cost about 400€ million. It first opened to traffic December 16, 2004, making the trek for tourists from Paris to Spain a bit shorter. But it's not cheap: tolls are 6.40€ for light vehicles... Each way. Copyright 2011. Watermark theme. Powered by Blogger.